Port Saint Lucie, FLA — The Hampshire Companies, a full service, private real estate investment firm with equity in assets valued at more than $2.5 billion, announced today the acquisition of the Shoppes at St. Lucie West, a 264,000-square-foot retail center in Port St. Lucie, Florida, with joint-venture partner, Redfearn Capital based in Delray Beach, Florida. The purchase of the retail center includes 13-acres of vacant land which has already received approval for an additional 120,000 square feet of retail space and is located directly adjacent to the center. Located at 1313-1363 St. Lucie West Boulevard, Shoppes at St. Lucie West is less than two miles east of I-95 and less than 1.5 miles west of The Florida Turnpike and situated in a primarily commercial corridor. The retail center offers tenants excellent visibility with traffic counts exceeding 44,000 cars daily. 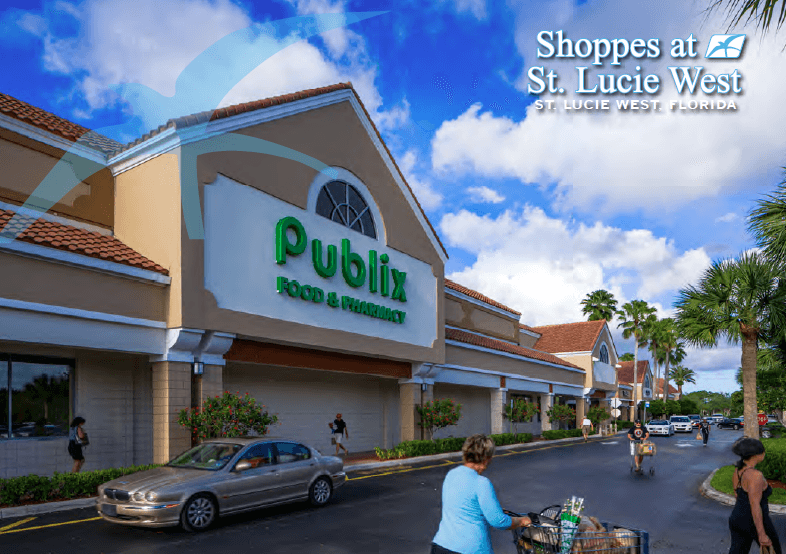 The 48,890-square-foot Publix anchors the center and is consistently a top performer drawing large amounts of foot traffic adding to the assets desirability. In addition to Publix, tenants include Burlington Coat Factory, LA Fitness and HomeGoods. Currently 30,000 square feet of space is available for lease and full occupancy of the site is expected in the near future as demand for highly visible retail centers strengthens within the marketplace. Redfearn Capital, will manage the site and will oversee tenant selection for the existing space as well as the future 120,000 square feet development. For information on the remaining space for lease at the Shoppes at St. Lucie West, please contact Alex Redfearns at aredfearn@redfearncapital.com. To stay connected with The Hampshire Companies and for updates on the latest transactions and news follow Hampshire on Facebook (www.facebook.com/hampshireco), Twitter (@hampshireco), and LinkedIn (www.linkedin.com/company/the-hampshire-companies). The Hampshire Companies is a full-service, private real estate investment firm based in Morristown, N.J. The Hampshire Companies is a vibrant, dynamic organization that combines creative vision and superior execution, thereby enabling it to create and enhance value in real estate investments. Additional information on The Hampshire Companies is available online at www.hampshireco.com. Redfearn Capital is a commercial real estate investment company based in Delray Beach, Florida. The Company’s approach to commercial real estate investing is branded by a significant emphasis on tenant relationships through a dedicated management team and experienced infrastructure investment professionals. Redfearn Capital focuses on strategic real estate acquisitions with a strong and reliable tenant base in unique locations in South Florida and Colorado.